Palitza, K. (no date). 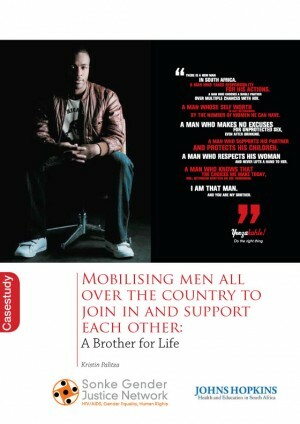 Mobilising Men All Over the Country to Join In and Support Each Other: A Brother for Life. Case Study by Sonke Gender Justice Network and John Hopkins Health and Education in South Africa: Cape Town, South Africa. South African women and girls face some of the highest levels of violence in the world. 1 in every 4 South African men admits to have raped a woman. Undeniably, it is men who commit the majority of acts of domestic and sexual violence. But many men and boys are strongly opposed to this violence and feel it has no place in a democratic South Africa. At the same time, there is a growing understanding among men that they have a critical role to play in addressing the gender norms, roles and relations underlying the HIV pandemic. Men start to recognise the vital role they can play in improving their own health and the health of their families. A national men’s campaign, called Brothers for Life (BfL), is now encouraging them to stand up and show other men how to make the right choice. It mobilises men from all over the country to start working together to build a stronger and healthier society. It shows men how their choices can either help or harm their health – and how these choices can then help or harm their community and country. The five-year campaign was launched by Johns Hopkins Health and Education in South Africa (JHHESA), Sonke Gender Justice (Sonke), the South African Department of Health (DoH), the South African National AIDS Council (SANAC) and other key stakeholders in the country. This case study highlights the process and rollout of the BfL campaign and the various components comprising the campaign as a whole.